H3Viewer 1.4 contains many user requests (If you have a feature please contact us). Can now click links with the middle button to open a topic in a new tab. We now support the extra MS Intellimouse side buttons (WM_XBUTTONUP events). They perform Browser Back and Browser Forward same as in Google Chrome. Also Hold down Ctrl to change page tabs. H3Viewer uses Ctrl+F4 to close page tabs. 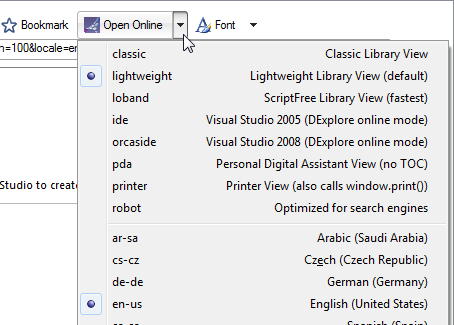 You can now also use Ctrl+w (same as IE8). We now restrict the TOC to show only Visual Studio 2010 content. Previously we displayed all raw data returned by the API call, which was not always helpful. We are following MS on this (watching as they build their full TOC experience). Set ShowTocMode=y if you want to see the original raw unfiltered TOC. Set =y then restart H3Viewer. You will now see 3 new menu items in the TOC (right+click) context menu. You can now specify the device view and language via an options dropdown. Also you can now click Open Online for MSDN web pages (not just local help content). This new browser toolbar button allows you to override the default font of a page (see below). 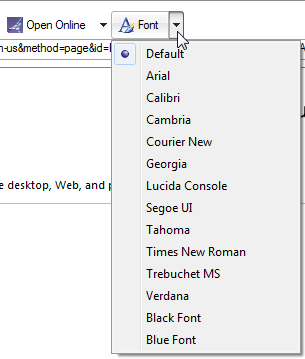 The fonts are defined in H3Viewer.ini if you want to modify the list. Now allow MS Help Viewer 1.1 CTP Beta to show in menus, but not the earlier incarnation of MS Help Viewer Power Tool (We still display a warning popup for that). Added French translation -- by Julien Lebosquain - See blog.lebosquain.net (many thanks Julien!). TOC control now uses Win 7 type expando triangles (was old fashioned +\- buttons). Tweak other UI elements for minimal look.